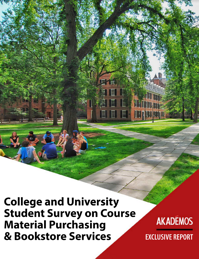 Today, we announced the release of an exclusive new white paper that highlights the results of our proprietary 2018 College and University Student Survey on Course Material Purchasing and Bookstore Services. This report provides valuable data and insightful analysis on student perceptions and behaviors as they relate to textbooks and course materials. While the report confirms common assumptions regarding how the rising cost of course materials is a hardship for many students, the study also reveals that students are now, at an increasing rate, choosing not to purchase materials and/or opting out of some classes due to these costs. The implications of this emerging behavior, including limiting students’ potential career choices, are examined in our recently published white paper. The report, which represents responses from nearly 1,300 students, nationwide, provides valuable information on a variety of topics related to how students view their required course materials and the role of the school-sanctioned bookstore.